Ecology proudly serves the City of Norco with exceptional recycling services through our Fontana Recycling Center. Here, residents and businesses alike can take advantage of the streamlined process available through our recycling center. Whether you have a large amount of scrap metal to recycle or want to drop off your CRV items, Norco area residents and businesses can count on Ecology’s Fontana Recycling Center. We make things simple for you, offering an efficient way for you to drop off your recycling and receive your compensation. Learn more about our recycling programs below. In general, Norco residents know that recycling is an important part of preserving the area’s natural resources. However, they may not know the specifics of how recycling helps the environment. 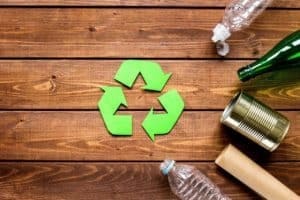 Recycling truly makes a big difference in lowering pollution rates. But how? 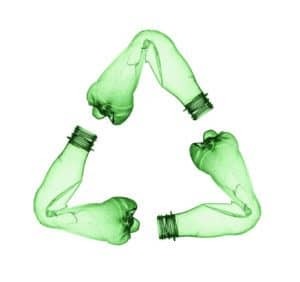 Here are three ways recycling benefits the environment. By recycling, you avoid throwing these items in the trash. Today, most trash is disposed of in a landfill or incinerator, where it creates pollution. You can minimize pollution by always taking in your recyclable items. The use of recycled materials can help minimize the need for mining. In manufacturing, there is a constant need of materials and inputs. New materials require mining which has many detrimental effects on the environment such as pollution and disruption of animal and plant habitats. With recycled inputs, the need for mining is lessened. Manufacturing with recycled materials can save energy. New materials often require more processing than recycled materials. 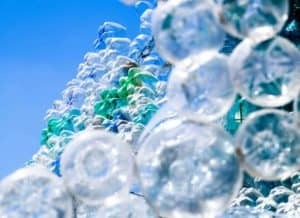 With these reasons in mind, you can take in your recycling, confident that you’re making a difference. An added bonus is that recycling also pays. You can earn money from turning in your scrap metal and CRV items to our Fontana Recycling Center. The value of recyclable items vary. However, the more you bring in, the higher the payoff. And remember, you’ll also enjoy the satisfaction of knowing you’re supporting the preservation of Norco’s natural resources. Scrap metal is defined as metal that’s no longer used for its original purpose. Old sheets of metal, broken appliances, industrial scrap and manufacturing offsets are some examples of common sources of scrap metal. Through Ecology’s scrap metal recycling program, we give this formerly useless metal new life and a new purpose. There are two main categories that scrap metal is divided into: ferrous and non-ferrous. Each of the types of scrap metal are used for different applications because of their unique characteristics. Prior to processing for recycling, scrap metal is nearly always sorted according to these two categories. Ferrous metals are magnetic metals that contain high amounts of iron and steel as components. These metals are often sourced from items such as demolition scrap, metal offsets from manufacturing and industrial uses, structural steel, old appliances, used vehicles and more. These metals are often separated from non-ferrous metals using a large magnet. That way, the two types of metals can be processed separately. 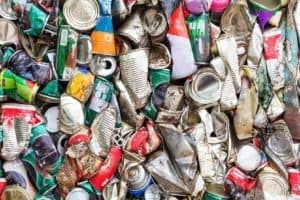 Ferrous metals are not as valuable as non-ferrous metals, but they are still important to recycle. Through recycling, you contribute to a brighter future for our planet and a more beautiful Norco. Non-ferrous metals are different from ferrous metals. The main difference is that non-ferrous metals are not magnetic. In addition, they are composed of metals other than iron and steel. Some common examples of non-ferrous metals include aluminum, copper, nickel and bronze. One metal that’s often incorrectly thought to be ferrous is stainless steel. Although this metal has the word “steel” in its name, it is actually a non-ferrous metal. You can find non-ferrous metals in many different applications and environments including factories and homes. Some common sources of this type of metal include plumbing hardware, window frames, bicycle frames, wires, car parts, among others. Typically, these metals command a higher price than ferrous metals. For residents of Norco, our conveniently located Fontana Recycling Center is the perfect place to bring your ferrous and non-ferrous scrap metals like aluminum, brass, tin, copper, steel and iron. CRV is a program created by the state of California and is part of the state’s wider recycling and environmental responsibility programs. 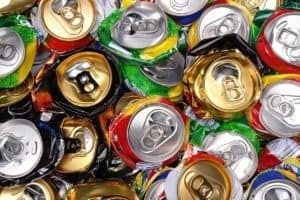 Through this program, individuals and businesses who purchase CRV items such as juice, wine, beer, canned goods and more, are encouraged to turn the packaging back in to be recycled after using the product. The incentive lies in the fact that you pay a small fee every time you purchase a CRV item that can only be redeemed after turning in your CRV items to a certified recycling center such as our Fontana Recycling Center. Typically, CRV items are processed by counting them. In large amounts, when over 50 units of the same type are brought in, the items may be processed by weight instead. Claim your CRV compensation by bringing in your clean and dry CRV items to the Fontana Recycling Center just northeast of Norco. Ecology’s mission is to offer recycling support for the residents and businesses of Norco. Whether you’re an individual citizen or part of a business, we have a recycling program aimed to help you. Our center’s streamlined process makes bringing in your CRV items and scrap metal for compensation very easy and efficient. For businesses, organizations and industries that deal with large amounts of scrap metal and CRV, we offer additional support. Call to learn about our roll-off bins that we can deliver to your property, making for easy recycling. When you have filled your bin, we’ll pick it up and leave a new, empty bin. 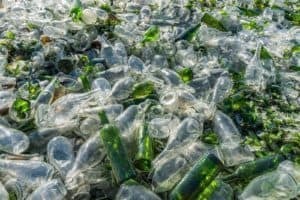 While we are proud of the wide variety of recyclables that we can process, at this time there are some items we can’t receive. The capacities of our facilities and safety measures in place make it impossible for us to accept or process the following items. Not sure about your items? Feel free to contact our Fontana Recycling Center for more information and to learn about our current compensation rates. Norco is a small city nestled just north of Corona and west of Riverside. With proximity to the great metropolis of Los Angeles, Norco enjoys a small town feel with access to larger cities. The city of Norco is known for its unique horse trails that take the place of sidewalks throughout the city. Ecology Recycling is dedicated to providing the best in recycling to the hard-working, responsible residents and businesses of Norco. Our high quality recycling service focuses on user-friendly services that make recycling quick and getting your compensation easy. We want to serve you in all of your recycling needs. Please contact our Fontana Recycling Center with any questions you have about our services and to learn more. We look forward to serving you soon.